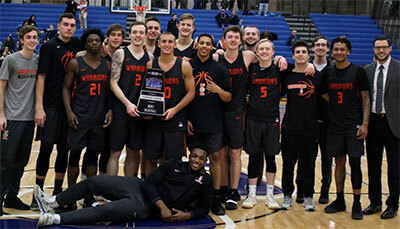 Third-seeded Indiana Tech staged the upset of the tournament, defeating top-seeded Cornerstone 72-61, to claim the 2019 Wolverine-Hoosier Athletic Conference (WHAC) Men's Basketball Tournament. The Warriors become just the second third seed to win the tournament; Cornerstone did it in 2014. With the tournament title, Indiana Tech receives the league's second automatic berth to the NAIA Division II Men's Basketball National Championship. Cornerstone received the first auto bid with the regular-season championship. Indiana Tech capped off the first half with a 7-0 run highlighted by a steal by Edmond Early (6'1''-G), Jr. and a dunk by Josh Klein for a 34-31 lead at the break. Sam Vander Sluis (6'9''-C) and Gabe Meriwether (6'3''-G) opened up the second half with the first five points for a short-lived Cornerstone lead. Twenty seconds later, Tech reclaimed the lead on a three by Dylan Phair (6'1''-G). The teams traded baskets with Indiana Tech remaining in front by the narrowest of margins until Early, Jr. hit a layup at the 12-minute mark for a six-point advantage. Cornerstone chipped the lead down to one point when Christian Rodriguez (5'11''-PG) hit a layup at the 9:06 mark. Early, Jr. and Klein responded for the Warriors for a little breathing room, but Vander Sluis closed the gap to a single point at 55-54 with just over five minutes left. Indiana Tech then went on a 17-7 run to close out the game, including 4-for-4 from the free throw line in the final minute. Mitch Morken (6'4''-G) scored a career-high 21 points while adding a career-high six steals to lead the Warriors. Early, Jr. had 15 points, seven assists and four rebounds while Josh Kline (6'9''-F) added 14 points, seven rebounds and two blocks off the bench. Dylan Phair chipped in 12 points while Max Huber grabbed a career-high 14 rebounds to push Tech to 22-11. Vander Sluis led Cornerstone with 23 points, 18 rebounds, and three blocks. Meriwether added 15 points as the only other Golden Eagles (25-8) in double figures. F: Deshawn Lewis (6'4''-F) of Aquinas Coll. PG: AJ Atwater (6'0''-PG) of Aquinas Coll. PG: Zezva Liluashvili (6'0''-PG-95) of Aquinas Coll.